You don’t need to leave Manila to add reds, tangerines, yellows, or even salmon in your Instagram feed. We’ve headed for that best-sunsets-in-Manila hunt just for you. Spending one late afternoon in Manila Manila Bay got us thinking: ‘are there other places in the Metro where you can see the kind of a sunset you get from here?’ The first thing that popped into our heads was on the rooftop of Makati’s skyscrapers but they’re not exactly open-access. Today, we list down five places in Metro Manila where you can capture a sunset as stunning as Manila Bay’s without the need to worry about being caught for trespassing. It’s exactly the same body of water as the one along Roxas Boulevard, but there’s a bit of a twist. Visit Sofitel Philippine Plaza Manila’s Sunset Bar just before sundown and you’ll enjoy a clearer view of the world-class Manila Bay sunset by the pool and a glass of margarita in hand. Make your sunset extra special and drop by on a Friday or Saturday night when the hotel offer their famous grilled barbecue specialties on the menu —definitely worth the traffic you’ll possibly encounter along the way. The University of the Philippines’ main campus in Diliman, Quezon City isn’t only home to some of the country’s brightest minds. It’s also home to places that you can take stunning photos of things like The Oblation or the Sunken Garden. Good ol’ Oble is a bit shy since he faces away from the sunset, but get it right and you’ll have a non-risque silhouette. The Sunken Garden is an open field in the middle of the campus with benches at road level and people scurrying about in the middle of the field. Point your camera towards the sun and you’ll get a shot of both the field, the UP Main Library, and the mini forest that act as shade for the weary. This one is a bit eerie, but it’s worth the trip. The Libingan ng mga Bayani or Heroes’ Cemetery in Taguig is home to row upon row of crosses marking the graves of those who have served the country. You won’t just see a sunset that’s both eerie and serene thanks to the white crosses; you’ll also come across graves of some of the most notable names in Philippine History, including National Artists and former Presidents. 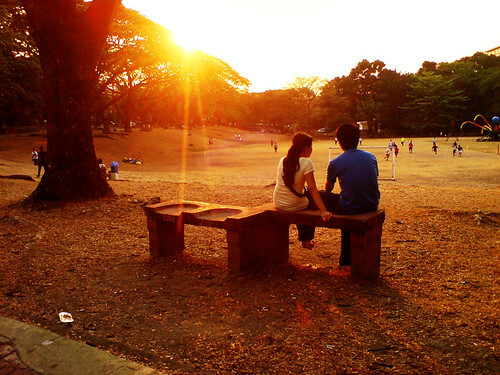 Yes, there are a lot of places in Makati for you to catch a beautiful sunset. It’s full of skyscrapers, after all. But not all are accessible to anyone out to see a sunset on a whim. Good thing there are places in Makati like Hole in the Wall at Century City Mall. It’s an easy enough “climb” to the top (Century City only has four floors, and it’s on the fourth floor). The way Hole in the Wall is designed makes it easy to look out onto the city—a perfect backdrop without the risk of being sent to the police station. Okay, this one’s admittedly a bit of a cheat, but Antipolo, Rizal is only one ride away from Metro Manila. That’s the same amount of time it will take you to move from one city of Metro Manila to another in today’s world of traffic congestion. Being on top of a plateau, it’s easy to get a sunset shot of most of Ortigas, especially from places like Cloud 9 or any of the restaurants on its side of Sumulong Highway.